War and economic crisis in Yemen has left an estimated 3.3 million people, including 2.2 million children, suffering from acute malnutrition and 460,000 under 5 have severe acute malnutrition. “Because of the crumbling health system, the conflict and economic crisis, we have gone back to 10 years ago. A decade has been lost in health gains,” she said, with 63 out of every 1,000 live births now dying before their fifth birthday, against 53 children in 2014. Yemen has been divided by nearly two years of civil war that pits the Iran-allied Houthi group against a Sunni Arab coalition led by Saudi Arabia. At least 10,000 people have been killed in the fighting. As of January 16, 2017, Chinese health authorities have confirmed 120 new human cases of avian influenza A (H7N9) to the World Health Organization since September 2016. Most of these patients reported exposure to live poultry or poultry markets. A few cases of H7N9 have been reported outside of mainland China but most of these infections have occurred among people who had traveled to mainland China before becoming ill. CDC advises people traveling to China to avoid contact with poultry (including poultry markets and farms), birds, and their droppings and to avoid eating undercooked poultry. Infected birds that appear healthy may still be able to transmit this virus to humans. There are no recommendations against travel to China. What is avian influenza A (H7N9)? Avian influenza A (H7N9) is a virus found in birds that does not normally infect humans. However, in the spring of 2013, the first human cases of H7N9 virus infection were reported in China. Since then, 924 laboratory-confirmed cases of human infection with H7N9 virus have been reported, with about one-third of cases resulting in death. Most of these infections have been associated with exposure to infected poultry or contaminated environments (such as poultry markets) in China. In rare cases, limited, non-sustained person-to-person spread of H7N9 virus likely occurred, but there is no evidence of sustained human-to-human infection. Early symptoms are similar to those of other respiratory viruses, including seasonal flu and may include fever, cough, sore throat, muscle aches and fatigue, loss of appetite, and runny or stuffy nose. However, infection with this virus often causes severe respiratory illness and, in some cases, death (see http://www.cdc.gov/flu/avianflu/h7n9-virus.htm). Risk factors for severe and fatal outcomes include older age and having certain chronic medical conditions. Don’t touch birds, whether they are alive or dead. Avoid live bird or poultry markets, including where birds are slaughtered (wet markets). Avoid places that might be contaminated with bird feces. .
Eat food that is fully cooked. Eat meat and poultry that is fully cooked (not pink) and served hot. Eat hard-cooked eggs (not runny). As a general precaution, don’t eat or drink dishes that include blood from any animal. As a general precaution, don’t eat food from street vendors. If soap and water aren’t available, clean your hands with hand sanitizer containing at least 60% alcohol. Try to avoid close contact, such as kissing, hugging, or sharing eating utensils or cups with people who are sick. Talk to your doctor or nurse if you feel seriously ill, especially if you have a fever, cough, or shortness of breath. Tell your health care provider about your travel to China. Clinicians should consider the possibility of avian influenza A (H7N9) virus infection in people presenting with respiratory illness within 10 days of travel to China, particularly if the patient reports exposure to birds or poultry markets. Although most H7N9 cases have resulted in severe respiratory illness, infection may cause mild illness in some people, including both adults and children. Guidance for clinicians who suspect avian influenza A (H7N9) virus infection in a returned traveler from China is available. Clinicians should initiate infection control precautions (airborne, droplet, and contact), obtain appropriate specimens, and notify their local or state health department promptly. State health departments should notify CDC of suspected cases within 24 hours. Empiric treatment with influenza antiviral medications may be warranted while testing is pending. Note that influenza diagnostic testing in patients with respiratory illness of unknown etiology may identify human cases of avian influenza A virus infection. Patients with H7N9 virus infection are expected to have a positive test result for influenza A virus via reverse-transcription polymerase chain reaction (RT-PCR testing), although most assays will not be able to determine the influenza virus subtype. Use of rapid influenza diagnostic tests are not recommended if H7N9 virus infection is suspected. 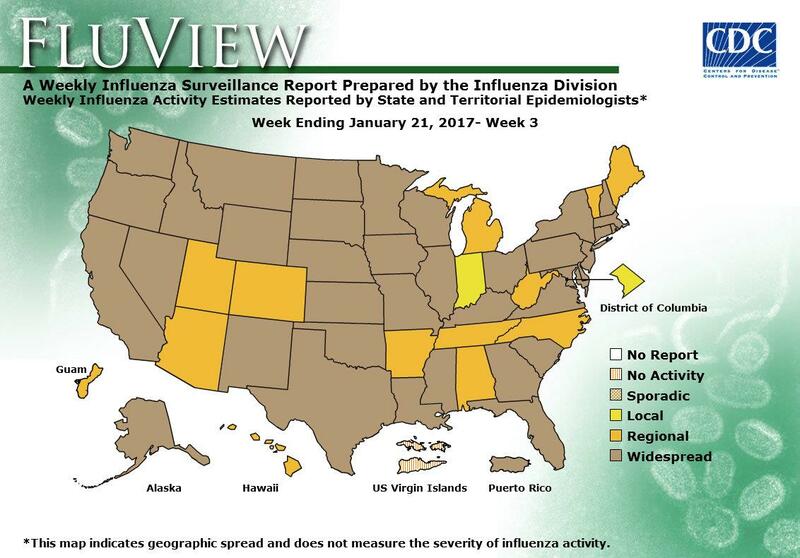 During week 3 (January 15-21, 2017), influenza activity increased in the United States.. Viral Surveillance: The most frequently identified influenza virus subtype reported by public health laboratories during week 3 was influenza A (H3). The percentage of respiratory specimens testing positive for influenza in clinical laboratories increased. Influenza-associated Pediatric Deaths: Three influenza-associated pediatric deaths were reported. Influenza-associated Hospitalizations: A cumulative rate for the season of 15.4 laboratory-confirmed influenza-associated hospitalizations per 100,000 population was reported. Outpatient Illness Surveillance:The proportion of outpatient visits for influenza-like illness (ILI) was 3.4%, which is above the national baseline of 2.2%. 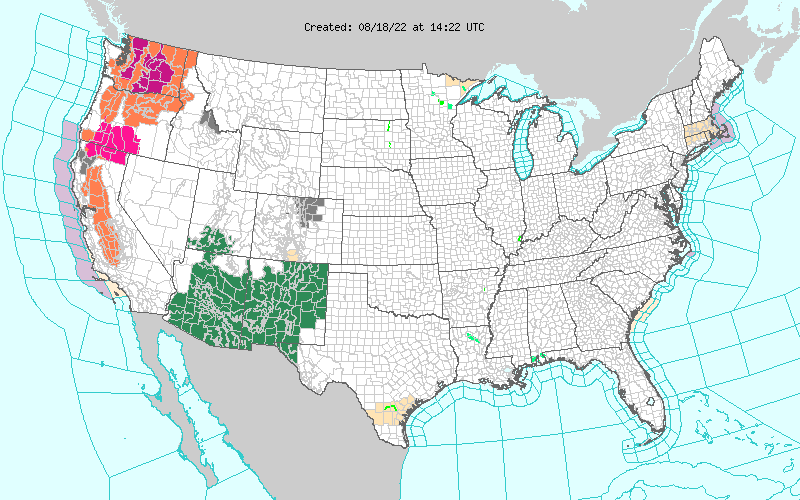 All 10 regions reported ILI at or above their region-specific baseline levels. New York City and 10 states experienced high ILI activity; 10 states experienced moderate ILI activity; Puerto Rico and 17 states experienced low ILI activity; 13 states experienced minimal ILI activity, and the District of Columbia had insufficient data. Geographic Spread of Influenza: The geographic spread of influenza in Puerto Rico and 37 states was reported as widespread; Guam and 12 states reported regional activity; the District of Columbia and one state reported local activity; and the U.S. Virgin Islands reported no activity. Chile: Wildfires rage in central and southern Chile, fanned by strong winds, hot temperatures and a prolonged drought. These 100 objects have made their mark on public health. A list of 100 objects to recognize the Centennial of the Johns Hopkins Bloomberg School of Public Health — and to help us appreciate the vast reach of public health. Nearly three years after Ebola hit Sierra Leone, millions of dollars in funds raised to fight the deadly virus have still not been accounted for. Chinese health authorities have confirmed 120 new human cases of avian influenza A (H7N9) since September 2016, with 37 deaths. Chinese health authorities have confirmed 120 new human cases of avian influenza A (H7N9) since September 2016, with 37 deaths. Most of these patients reported exposure to live poultry or poultry markets. Infections have been reported in the provinces of Jiangsu, Fujian, and Guangdong, as well as the Macau and Hong Kong Special Administrative Regions. CDC advises people traveling to China to avoid contact with poultry (including poultry markets and farms), birds, and their droppings and to avoid eating undercooked poultry. There are no recommendations against travel to China. Avian influenza A (H7N9) is an influenza (flu) virus found in birds that does not normally infect humans. However, in spring of 2013, China began reporting infections with the virus in people. Most of these infections have been associated with contact with infected poultry or contaminated environments (such as poultry markets) in China. In rare cases, it can be spread from person to person. Early symptoms are similar to those of seasonal flu and may include fever, cough, sore throat, muscle aches and fatigue, loss of appetite, and runny or stuffy nose. However, infection with this virus often causes severe respiratory illness and, in some cases, death (see http://www.cdc.gov/flu/avianflu/h7n9-virus.htm). Do not touch birds, pigs, or other animals. Don’t touch animals, whether they are alive or dead. Avoid live bird or poultry markets. Avoid other markets or farms with animals (wet markets). Don’t eat or drink dishes that include blood from any animal. Don’t eat food from street vendors. Clinicians should consider the possibility of avian influenza A (H7N9) virus infection in people presenting with respiratory illness within 10 days of travel to China, particularly if the patient reports exposure to birds or poultry markets. Although most H7N9 cases in adults have resulted in severe respiratory illness, infection may cause mild illness in some. Illness also has been reported in children. Influenza diagnostic testing in patients with respiratory illness of unknown etiology may identify human cases of avian influenza A or new cases of variant influenza (such as human infections caused by influenza viruses from pigs) in the United States. Patients with H7N9 infection are expected to have a positive test result for influenza A virus via reverse-transcription polymerase chain reaction (RT-PCR testing) that will be unsubtypeable by most assays. Nonmolecular rapid test results may be variable. Clinicians who suspect avian influenza A (H7N9) should initiate infection control precautions (airborne, droplet, and contact), obtain appropriate specimens and notify their local or state health department promptly. State health departments should notify CDC of suspected cases within 24 hours. Frequently Asked Questions on human infection with influenza A (H7N9) virus, China (WHO). India: In the aftermath of banning 86% of the country’s currency, children are forced to go without fruit, vegetables and milk — now unaffordable luxuries.